Hey, if it’s good enough for Jimmy Fallon, popular new host of “The Tonight Show,” let’s all get on board: Be the first in your hood to start The Handwritten Thank You Note Movement! 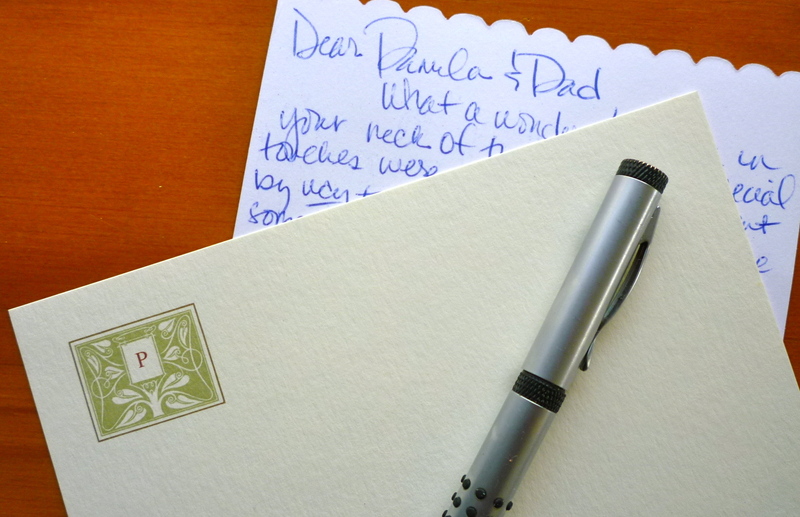 Time to forget about those generic email thank yous. Surprise! This ritual of politesse is not just for the Senior Set. Check out what Carroll Irene Gelderman, 20, a Columbia University student from New Orleans did when she was named the 2014 Queen of Carnival. Order new stationery, of course, to thank all those in her Mardi Gras Queen’s court paying homage. Apparently, we’re talking hundreds of gifts here. “It is so important, in a digital world, to have the dignity to sit down and write something in your own hand,” adds Cristiano Magni, a New York fashion publicist who would know a thing or two about communicating. “It not only strengthens the bonds between people, in your personal life and in business,” Magni says about sending a handwritten note. “It also rings an emotional chord.” Too true. Looks like we can silence the death knell sounding the demise of the independent bookstore – for now. And ironically, the good news hales from Seattle, home of Amazon which is often blamed for how these bookstores are struggling and, even worse, closing. Seattle’s Elliott Bay Book Company, one of the city’s largest independent booksellers, reports its first substantial profit in almost 20 years! According to the American Booksellers Association Seattle has become one of the most successful independent bookstore cities in the country. For each month, Nissley also supplies a suggested reading list. What more could a book lover ask for? Alas, with the good, must come the sad: the closing last week of Rizzoli, that bookstore jewel on Manhattan’s 57th St. When in New York, I’d always try to stop by and be comforted by its old-world, quiet and civilized interior with classical music to match. All those foreign magazines, the rich and weighty coffee table books. I will miss it. My brother met Don at Tulane Law School in New Orleans many years ago. They were classmates and stayed close friends even with Don remaining not far from New Orleans in nearby Pass Christian, MS on the Gulf Coast and Tony living miles away in Maryland. Don took a graduate degree at NYU when I was working in New York and we’d occasionally pal around. A loyal friend, he came to my wedding in Oregon in the late Eighties. Several years later we visited Don in Crested Butte, CO which may have been the last time I saw him. Over the years, I would hear about Don from Tony, trips he had taken, visits he had made. He loved to travel and was a great history buff. This winter, we learned that Don had been in a car accident in April 2013 which plunged him into a coma. Only after he died last month, never regaining consciousness, did some of the details of the accident come through. He had been on his cell phone, either talking or texting – DOES IT MATTER? – and had gotten distracted. What a pointless way to leave such a full life, one that included his wife, Kathleen, and daughter, Elizabeth.